From business trips to family excursions, Courtyard Orlando Downtown invites all travelers to discover the right blend of comfort, convenience and service. Getting around town is simple when using the city's complimentary shuttle service, providing transportation up to a 3-mile radius. Catch a soccer match at Orlando City Stadium, explore boutiques within Thornton Park and rent a swan paddle boat at Lake Eola Park. At the end of an eventful day, find relaxation in our stylish rooms boasting pillow top mattresses. Stay connected and entertained with free Wi-Fi and smart TVs offering Netflix and YouTube access. Once you wake up, start your day off right with breakfast wraps and Starbucks coffee at The Bistro, our on-site restaurant also serving lunch, dinner and evening cocktails. Continue your exercise regimen at our well-equipped fitness center, then soak up the Florida sunshine by our heated, outdoor pool. 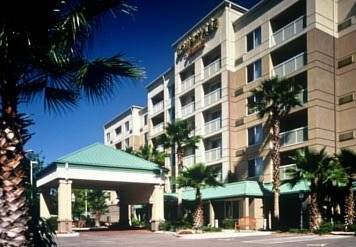 Let Courtyard Orlando Downtown be your beacon to a successful visit. From morning to night, The Bistro is your destination for delectable, fresh choices during your stay in Downtown Orlando. We offer Starbucks coffee, signature cocktails and seasonal options to please your palate.